I will be making a short swing through the east coast this month, giving talks at La Salle University in Philadelphia on Feb. 17 (see attached flyer for details) and at the New School in NYC on Feb. 19 (details TBA). 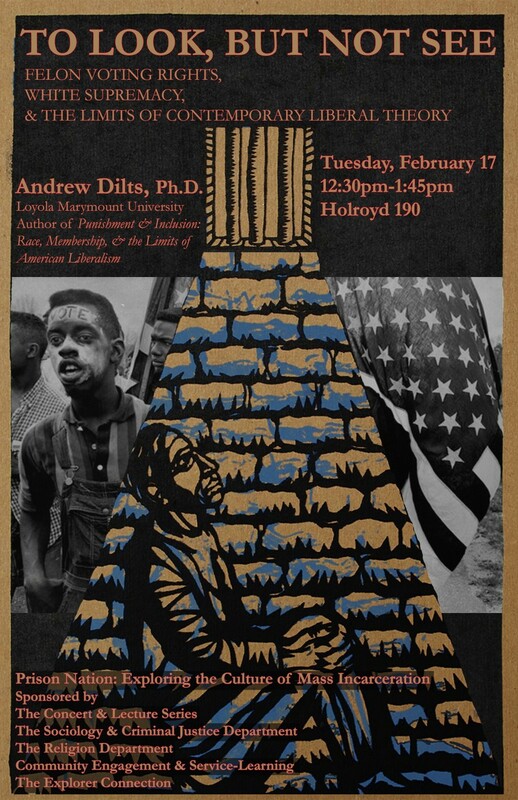 I’ll be talking about my book, Punishment and Inclusion, at both events, and hope folks come out to talk about felon voting rights and prison abolition. What I’m most pleased about seeing my book land in this of the top 5 best critical theory books of 2014 is the company with which it keeps: Audra Simpson, Glen Coulthard, Sara Ahmed… a pretty incredible set of folks. And, it’s a real joy to see a “critical theory” list made up almost entirely of scholars of color doing radical theory. That is to say, this list isn’t made up of the usual suspects. I’ve added a page to keep track of upcoming talks and lectures that I will be giving. Most of them this spring will be related to Punishment and Inclusion, but I’ll be presenting some new work as well at a few places. In particular, I’m really excited to be giving the keynote address at the University of Memphis Philosophy Graduate Student Association Conference, Beyond Bars: The Future of Prisons in February. It’s an honor to be invited and a true privilege to get a chance to talk with a bunch of very smart students and faculty there. It’s been a few months since Punishment and Inclusion: Race, Membership, and the Limits of American Liberalism was released by Fordham University Press, and it’s been amazing to hear responses and see copies showing up in the hands of folks out there in the world. I’ll be giving a bunch of talks in the near future about the book (as well as about some new projects that I’ve been working on), but in the meantime, you can follow updates at the Punishment and Inclusion page on facebook, download a copy of the preface and first chapter to read, and (obviously) pick yourself up a copy to read by the fireplace this winter. Thank you again to everyone that made this possible! Read a “Sneak Peak” of Punishment and Inclusion now! The good people at Fordham University Press have posted a “Sneak Peak” of Punishment and Inclusion in advance of its release in the next two weeks! You can download the preface and first chapter from their online archive here! punishment and inclusion on facebook! In a move that can only be described as (somewhat) shameless self-promotion, I have started a facebook page for Punishment and Inclusion: Race, Membership, and the Limits of American Liberalism. Head over there to “like” it and follow updates leading up its Sept. 15 publication date! Punishment and Inclusion now available for pre-order! 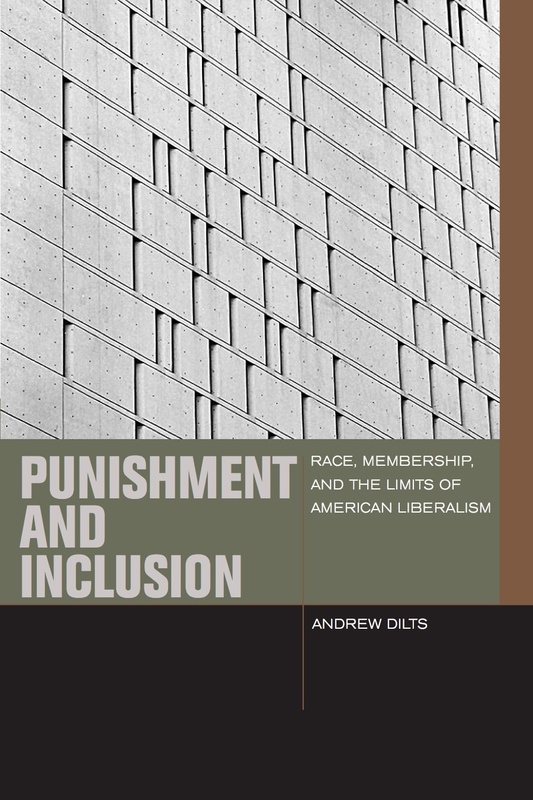 Punishment and Inclusion: Race, Membership, and the Limits of American Liberalism, is now available for pre-order. Snag it here from the Seminary Co-op in Chicago, or via that other internet bookstore people seem to use. I’m honored to be speaking this week at an amazing symposium organized by Brady Heiner in the philosophy department at Cal-State Fullerton: Rethinking Mass Incarceration: Gender, Race, and the Prison Industrial Complex. There is an amazing lineup of speakers, including Kimberlé Crenshaw, Alisa Bierria, Susan Burton, Kitty Calavita, Kristie Dotson, Lisa Guenther, Justin Levitt, Sarah Tyson, Johnita Wilbon and Azadeh Zohrabi. I recently received word that Death and Other Penalties, edited by Geoffrey Adelsberg, Lisa Guenther, and Scott Zeman, is now under contract with Fordham University Press. I am honored to have a chapter included in the volume called, “Death Penalty Abolition in Neoliberal Times,” which critically takes up the failure of Prop. 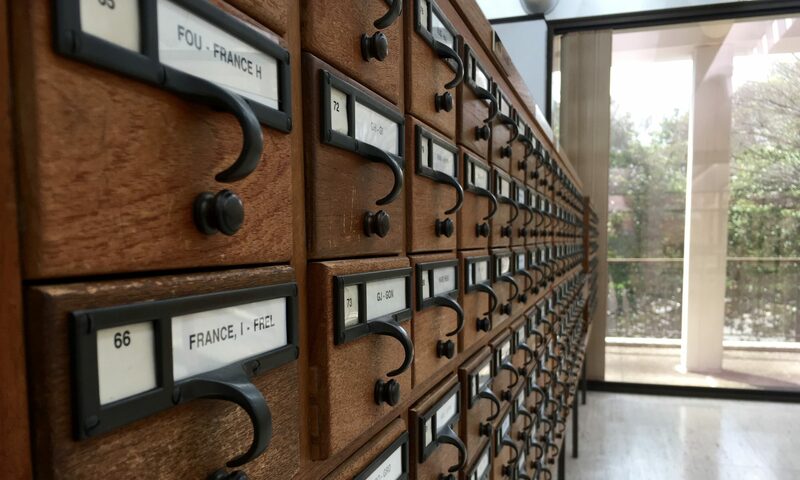 34 in California, LWOP sentencing, and Foucault’s writings on the death penalty. I was pleased to learn that my 2012 article, “To Kill a Thief: Punishment, Proportionality, and Criminal Subjectivity in Locke’s Second Treatise” is now a free download from SAGE. Also I am happy to report that my first book, Punishment and Inclusion, is fully in production from Fordham Press, as part of their Fall 2014 catalog.